and Alvin Hammer; group appeared in New York clubs including Village Vanguard and on radio and television; about 1944—contract with Fox; 1945—New York stage debut in Kiss Them for Me ; 1946—replaced ailing Jean Arthur in Born Yesterday : 3-year run of play established reputation; 1950—contract with Columbia; 1952—called to testify before Senate Internal Security Subcommittee because of activity in liberal organizations later labeled "communist"; 1954–55—TV appearances in 3 episodes of Max Liebman Presents ; 1956—in stage play Bells Are Ringing in role written for her by Comden and Green, and in film version, 1960. Awards: Best Actress, Academy Award for Born Yesterday , 1950. Died: Of cancer, 7 June 1965. Carey, Gary, Judy Holliday: An Intimate Life Story , New York, 1982. Holtzman, Will, Judy Holliday: Only Child , New York, 1982. Ciné Revue (Paris), 1 March 1979. Shout, John D., "Judy Holliday," in Films in Review (New York), December 1980. Film Dope (Nottingham), November 1982. Norman, Barry, in Radio Times (London), 30 November 1996. 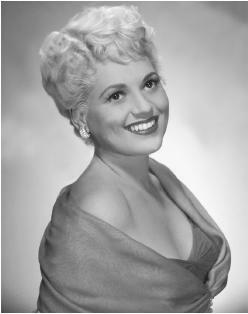 Judy Holliday did not star in many films—only seven. In her short career, however, she won an Academy Award for her first starring role in Born Yesterday. The first indication that Judy had a unique quality was evidenced in her part in Adam's Rib. She practically stole the show from Katharine Hepburn and Spencer Tracy. It was on Katharine Hepburn's insistence that Holliday got the part in Adam's Rib as a ploy to ensure that she got the part of Billie Dawn in Born Yesterday , a part she made famous on Broadway. Born Yesterday cast Holliday as a dumb blonde, but that is really an unfair description. Billie Dawn is not dumb, merely uneducated. As the film progresses we see through Holliday's fine acting a growth of character that an education can provide. Holliday was a stunning success as Billie Dawn and a successful career seemed eminent. But it was short-lived. Her fame brought her to the attention of the U.S. Congressional Committee on Un-American Activities. In addition to Holliday's sympathy for certain left-wing or liberal causes, Born Yesterday was being criticized in certain right-wing circles as communist propaganda. A lot of background maneuvering relieved some of the pressure on Holliday's career, and she filmed The Marrying Kind , a comedy/drama that was a social commentary on the pressures of the working class. Once again Holliday gave a stunning performance in a part quite different from that in Born Yesterday. Holliday displayed a wide acting range and proved that she was able to handle drama as well as comedy. Judy's unofficial blacklisting ended with It Should Happen to You , her fourth film with the director George Cukor. Holliday was cast as Gladys Glover, a woman striving to become famous. Gladys wasn't a dumb blonde exactly: she was more of an oddball. Judy took a mediocre script and turned her character into a dazzling kook. It is discouraging, however, that Hollywood was so shallow that an actress like Judy Holliday succeeds as one character and is forever cast in that mold. In Adam's Rib , Born Yesterday , and The Marrying Kind , Holliday demonstrated that she was an accomplished actress who could display a wide range of emotion and a naive, womanly innocence. It was unfortunate that her death was so untimely. It would have been interesting to see Holliday in films that she chose for herself.